For the centenary of the birth of John Cage, in 2012, was released this app, Prepared Piano, made with the sounds of a prepared piano (hence the name), probably very similar, if not identical, to those that the American composer realized for its Sontatas and Interludes in 1946. An app with no special pretensions which merely intends to celebrate the first anniversary of one of the most controversial and discussed composers of the twentieth century, of which the prepared piano was just one of many provocations which amazed the audience in those years. Freely available for Android and Apple smartphones, the application is also available for tablets but for a fee, with the availability of more features. The two versions differ in a few details. On the tablet you appreciate differences only for the sounds screen (you can view 30 of 36 versus 9 of smartphones) and the possibility to access to the recordings library. 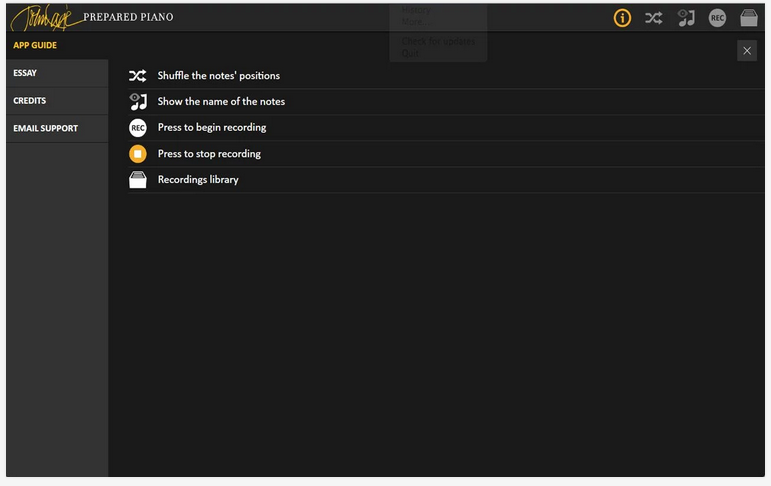 Prepared Piano allows both versions to record your performances, that you can share via Facebook or Twitter, with the difference that the free version only allows one record at a time, without possibility of creating your own personal collection. In general terms the app is very simple and intuitive. The controls, in the upper right, are essentially 5: the settings, the Shuffle (that allows you to sort the screen objects), the Note (to show the name of the notes), the Record button and, for the tablet, the key to access the recordings library. 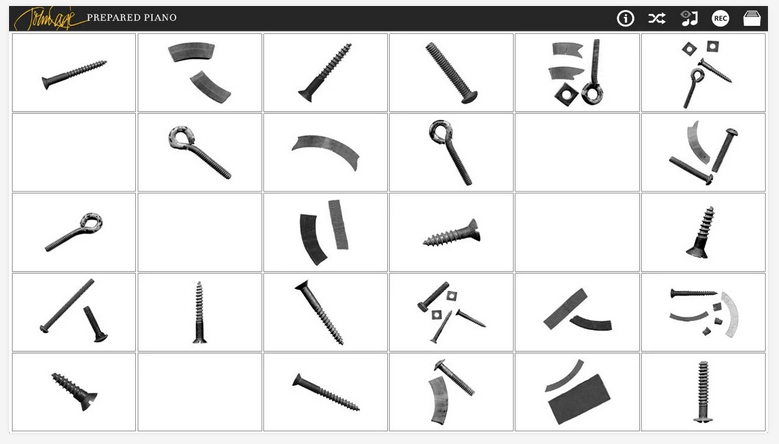 If you press Shuffle (the two crossed arrows), you can see on your screen a group of objects: screws, metal plates, nails and scrap metal of various types, all used with the aim to obtain new and unheard timbrical solutions. A screen with a few objects that are used to get the sounds. Each of these objects has been used to prepare a piano and get the sound samples used within the application. 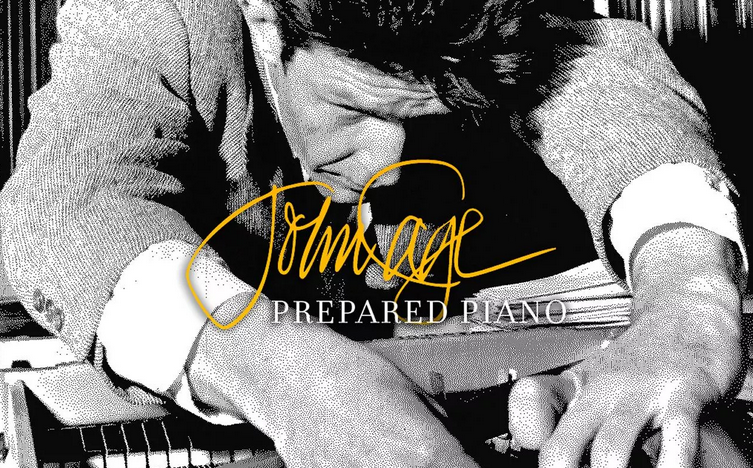 The recorded sounds were approved by the John Cage Trust, a foundation that takes care of preserving and disseminating the work of the American composer. If you want to download this app, please visit this link for the free android versions or this for your iOS device.